Learn the dances that will be on the program at the Victoria and Albert Ball. Third Sunday classes are from 5:30 to 8:00 pm May 19, June 16, July 21, August 18, and September 15, 2019 in Waltham, MA. Classes will cover the mid-nineteenth century contradances from the program as well as some waltz and polka basics. Beginners are welcome. It is not necessary to bring a partner to participate. Each class can stand alone, or you can come to more than one for extra practice. Immerse yourself in historical dancing, delightful refreshments, and a whirl of costumes. The Victoria and Albert ball will be a stunning recreation of a nineteenth-century ball in grand European style. 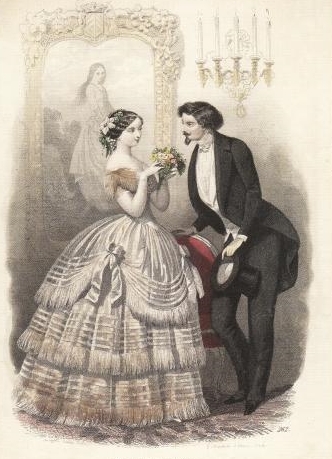 Please wear costumes from the years of Victoria and Albert’s marriage (1840 – 1861) or modern formal wear. Dances will be taught during the course of the evening. Beginners are welcome, and no partner is required to attend.